Fruita's Dinosaur Journey Museum will host a new exhibit â Sea Creatures of the Grand Valley. It kicks off Friday, April 18. WHERE: Dinosaur Journey, Fruita, Colo. COST: General admission to museum is $8.50 for adults, $6.50 for seniors, and $5.25 for children. When toothy beasts ruled the deep (around 80-90 million years ago), Colorado’s Grand Valley was located under expansive ocean. Ancient sea creatures dominated the aquatic environment, littering fossils throughout modern-day Mesa County (found in the exposed Mancos Shale sediment layer). To showcase the area’s unique history, Fruita’s Dinosaur Journey Museum will open its new exhibit — Sea Monsters of the Grand Valley — on Friday, April 18. The show will run through Sept. 7. 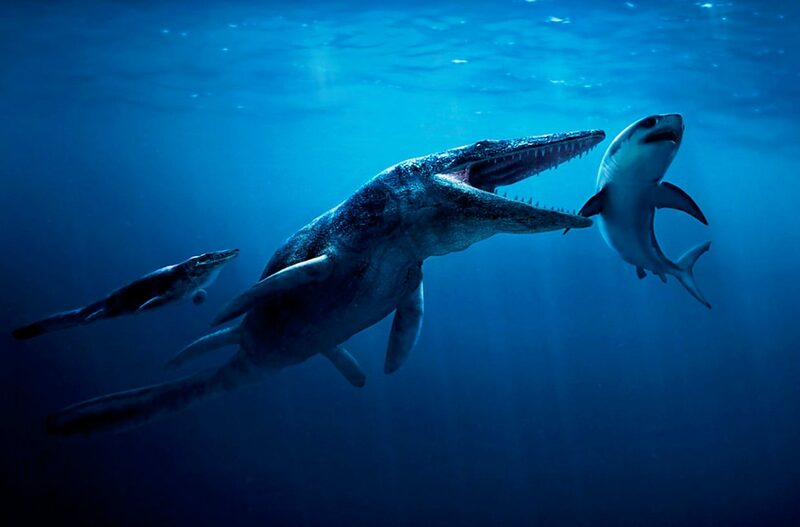 Among smaller aquatic fossils — like ancient mussels, ammonites (squid relatives) and clams — the fossilized remains of an elasmosaurid plesiosaur will be on display. This carnivorous marine reptile (with a long neck and four flippers) was discovered last summer near the Bookcliffs, northwest of Grand Junction Regional Airport. It’s estimated to be 40 feet long (roughly the size of a five-story building), and this type of fossil dates to the late Cretaceous Period. The fossilized remains of a Xiphactinus fish (excavated in 2012 on private land in Grand Junction), a small-sized plesiosaur (found locally in the 1980s), and a “duckbilled dinosaur that had floated out to sea as a carcass and became buried in the Mancos mud” will also be part of the display, a news release said. According to Foster, recent years exploring the Mancos Shale throughout Mesa County have been relatively fruitful, especially for vertebrates. The Mancos itself is “a layer of rock deposited by the Western Interior Seaway back when the Grand Valley was under several hundred feet of water,” Foster added. “The formation extends from the Colorado River up to the base of the Bookcliffs. For more information about Dinosaur Journey Museum in Fruita, call 970-858-7282 or visit http://www.museumofwesternco.com/visit/dinosaur-journey.